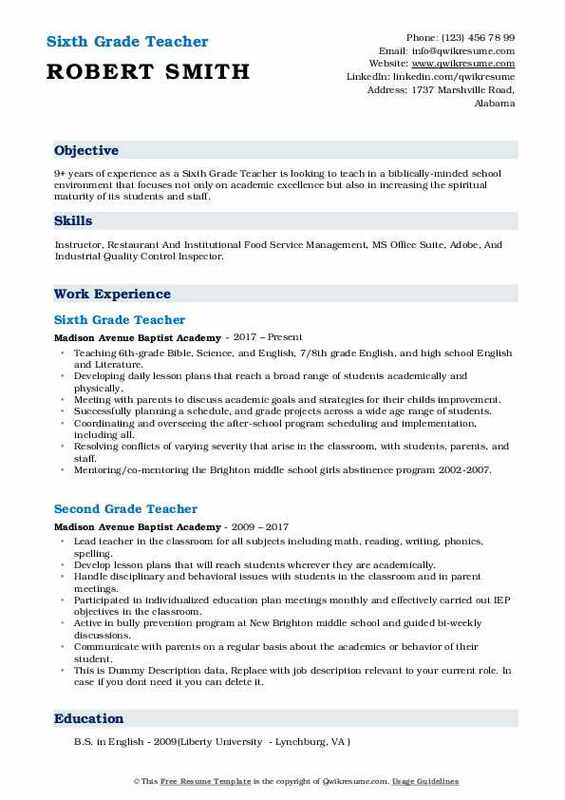 The job summary of a Sixth Grade Teacher is basically to provide basic academic, social skills and develop other formative skills among Sixth Grade Students. 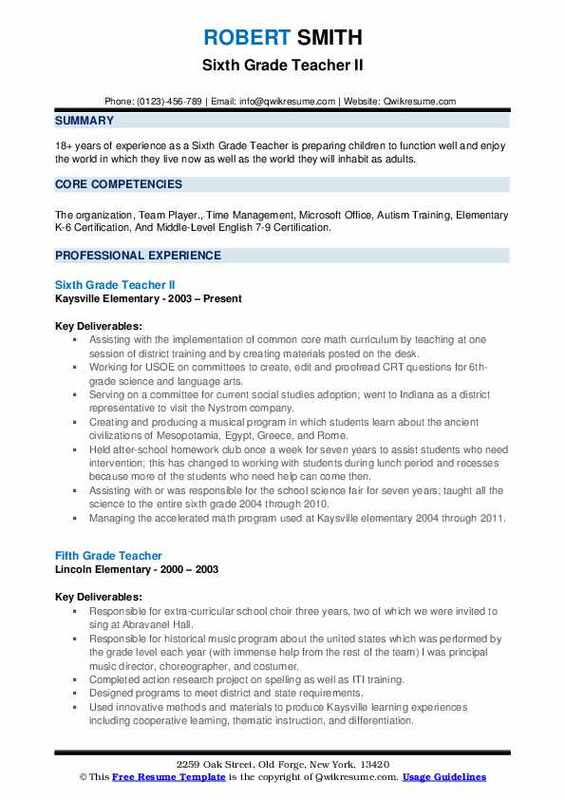 The roles and responsibilities that can be found typically on a Sixth Grade Teacher Resume include – educating and teaching subject matters such as reading, arts, social studies, health education and mathematics by employing various teaching means, developing age-appropriate lesson plans, maintaining discipline and order among children, evaluating academic progress of students, communicating with parents, and assisting in the personal progress of each and every child. To be a successful Teacher, these skills and abilities are necessary to be performed and groomed – strong communication and disciplining skills, analytical thinking and record maintaining abilities, a thorough knowledge of assigned subject and knowledge of state curriculum and Board of Education guidelines. A Bachelor’s degree in the relevant subject and a degree as well in education is needed to work as a Sixth Grade Teacher. Summary : 13+ years of experience as a Sixth Grade Teacher. A self-directed, dedicated, resourceful and goal-driven professional educator with a solid commitment to the social and academic growth of every child. Skills : Linux, Public Speaking, Leadership Development, Project Management, Computer Hardware, Organizational, And Windows OS. Responsible for classroom arrangement, management and maintenance in an educational forum. Exceeding and consistently maintaining 92% and higher on state-wide standardized tests. Monitoring student progress and performance against DISD pre-approved standards. Sponsoring student council and activities to assist hurricane victims in Haiti. Sponsoring and mentoring parents and students in the mother/daughter father/son program. Meeting with and communicated with parents and principals, as necessary, to resolve student challenges, praise positive behavior, and encourage and support parental assistance in the educational process. Meeting with students and parents independently, in an effort to improve retention as they relate to the educational process. Preparing and submitting progress reports on challenging students to parents and the principals as required. Students have performed with average percentages of 93 percent to 95 percent in math and reading respectively over nine years. Summary : 18+ years of experience as a Sixth Grade Teacher is preparing children to function well and enjoy the world in which they live now as well as the world they will inhabit as adults. Skills : The organization, Team Player., Time Management, Microsoft Office, Autism Training, Elementary K-6 Certification, And Middle-Level English 7-9 Certification. Assisting with the implementation of common core math curriculum by teaching at one session of district training and by creating materials posted on the desk. Working for USOE on committees to create, edit and proofread CRT questions for 6th-grade science and language arts. Serving on a committee for current social studies adoption; went to Indiana as a district representative to visit the Nystrom company. Creating and producing a musical program in which students learn about the ancient civilizations of Mesopotamia, Egypt, Greece, and Rome. Held after-school homework club once a week for seven years to assist students who need intervention; this has changed to working with students during lunch period and recesses because more of the students who need help can come then. Assisting with or was responsible for the school science fair for seven years; taught all the science to the entire sixth grade 2004 through 2010. Managing the accelerated math program used at Kaysville elementary 2004 through 2011. 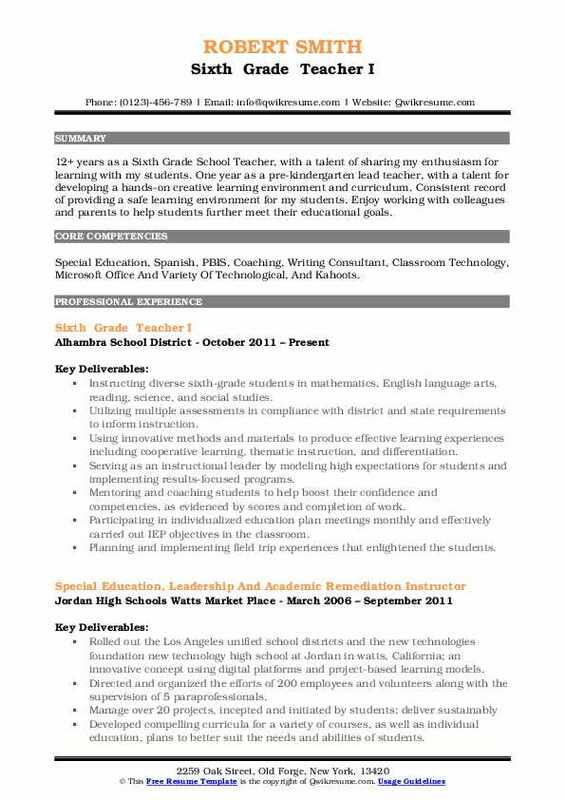 Objective : An outgoing and dynamically positive teacher with 4+ years of experience as a Sixth Grade Teacher. Skilled in delivering key points of information to a diverse group of people. 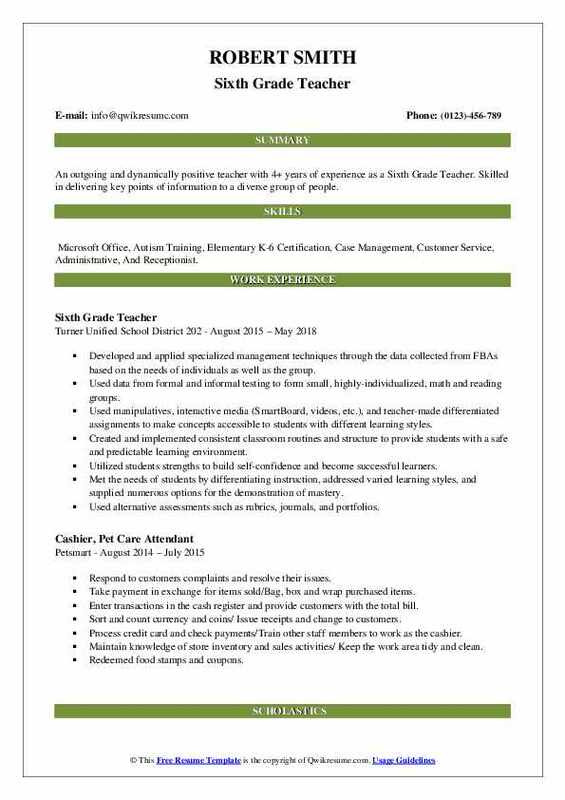 Skills : Microsoft Office, Autism Training, Elementary K-6 Certification, Case Management, Customer Service, Administrative, And Receptionist. Developed and applied specialized management techniques through the data collected from FBA's based on the needs of individuals as well as the group. Used data from formal and informal testing to form small, highly-individualized, math and reading groups. Used manipulatives, interactive media (SmartBoard, videos, etc. ), and teacher-made differentiated assignments to make concepts accessible to students with different learning styles. Created and implemented consistent classroom routines and structure to provide students with a safe and predictable learning environment. Utilized students' strengths to build self-confidence and become successful learners. Met the needs of students by differentiating instruction, addressed varied learning styles, and supplied numerous options for the demonstration of mastery. Used alternative assessments such as rubrics, journals, and portfolios. 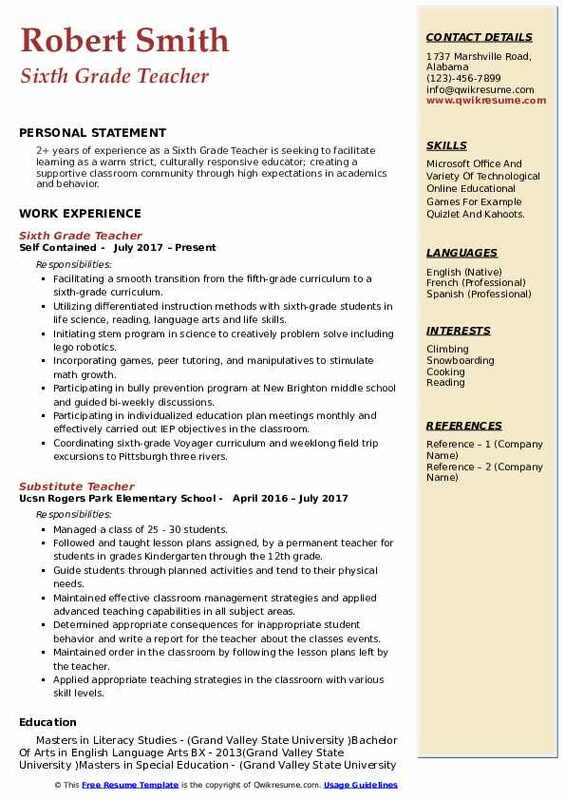 Summary : 7+ years of experience as a 6th Grade Teacher. A dynamic and passionate educator with the background encompassing middle school classroom teaching coupled with leadership roles and coaching experience. Skills : Microsoft Office (Word, Excel, PowerPoint, Outlook) as well as SMART Technologies, Renaissance Place, Customer Service, Clerical, Teaching, Volunteer Management, Filing, And Accelerated Reader. Teaching on a departmentalized team that serves 100 students in a large, urban, low-socioeconomic setting. Creating differentiated math and science lessons that aligned with core curriculum state standards and next-generation science standards and integrated technology across the curriculum. Incorporate best practices, including using formative and summative assessments as well as alternative assessments. Communicate regularly with parents/guardians. Unpacking common core state standards, create four-quarter-plan, fashion assessments using depth of knowledge, and design interdisciplinary units driven by common core. Conducting periodic review of student academic and behavioral benchmark data. Implementing a successful behavior management program through the PBIS model student-centered self-monitoring, and classroom meetings. Progress-monitor, benchmark, and instruct math and reading for response to intervention (RTI). Creating opportunities for parental involvement in the school through community outreach activities. Collaborating and conducting events to raise money and wrote a career awareness and development grant for iPads, successfully renewed for two years prior to discontinuation. 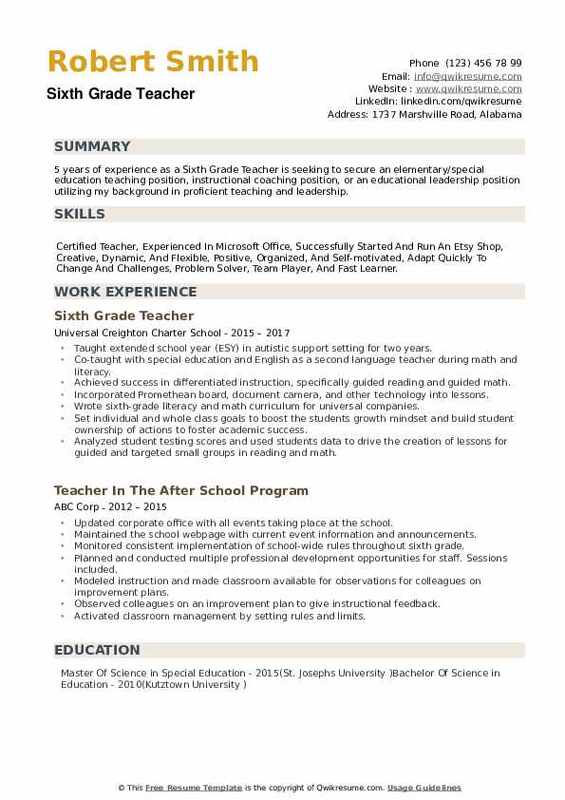 Objective : 4 years of experience as a Sixth Grade Teacher is seeking to obtain a position that will further my career in the field of Education. Implemented a common core aligned curriculum, lessons, projects, and homework. Analyzed and utilized student assessment data interactively with leaders and grade level team, to improve overall instruction and processes. Executed with expertise: think-pair-share: ELA practices, and classroom centers and writers workshop. Accomplished exemplary in-classroom support for inclusion teacher and grade level team. Mastered and excelled in the administration of informal and formal assessments, DRA reading levels map and PARCC assessments. Demonstrated mastery of teach-scape, on-course, and genesis online programs. Facilitated a smooth transition from the fifth-grade curriculum to a sixth-grade curriculum. Summary : 9+ years of experience as a Sixth Grade Teacher is looking to teach in a biblically-minded school environment that focuses not only on academic excellence but also in increasing the spiritual maturity of its students and staff. Skills : Instructor, Restaurant And Institutional Food Service Management, MS Office Suite, Adobe, And Industrial Quality Control Inspector. Teaching 6th-grade Bible, Science, and English, 7/8th grade English, and high school English and Literature. Developing daily lesson plans that reach a broad range of students academically and physically. Meeting with parents to discuss academic goals and strategies for their child's improvement. Successfully planning a schedule, and grade projects across a wide age range of students. Coordinating and overseeing the after-school program scheduling and implementation, including all. Resolving conflicts of varying severity that arise in the classroom, with students, parents, and staff. Mentoring/co-mentoring the Brighton middle school girls abstinence program 2002-2007. Objective : 4 years of experience as a Sixth Grade Teacher. My objective is to become established in a company that values integrity, ethics, and professionalism. 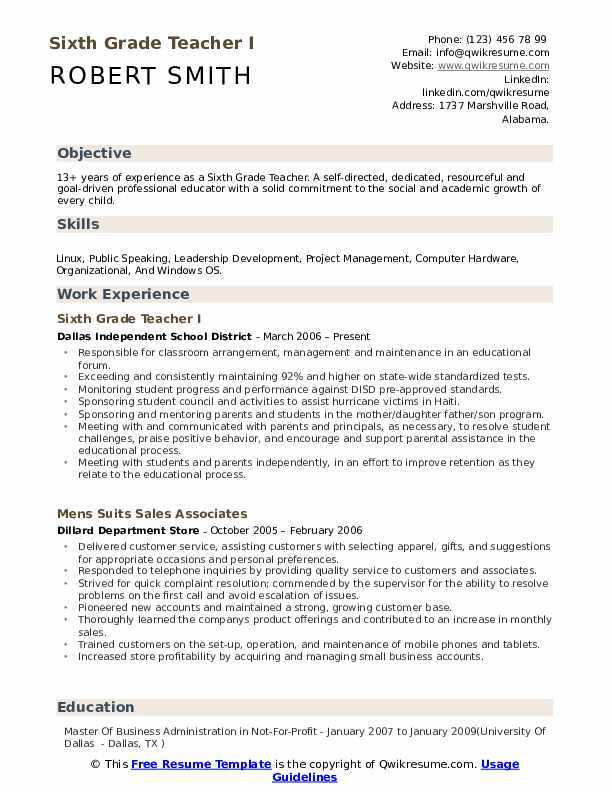 Skills : Customer Service, Clerical, Teaching, Volunteer Management, Filing, Legal Research, MS Office (Excel, Word, Outlook, etc. ), And Oracle. Developed and implemented sixth-grade language arts lesson plans that met the Virginia standards of learning and engage students through differentiated instruction and cooperative learning activities. Implemented technology in the classroom using Microsoft Powerpoint and Microsoft word in conjunction with lesson plans. Developed lesson plans that include instructional and reading best practices to maximize student success. Worked collaboratively with other teachers to create effective lessons that meet the learning needs and abilities of all students. Modeled and emphasized the importance of reading, vocabulary, and education. Effectively managed a safe classroom environment so all students can be engaged and contributing members. Coordinated sixth-grade Voyager curriculum and weeklong field trip excursions to Pittsburgh three rivers. Summary : 12+ years as a Sixth Grade School Teacher, with a talent of sharing my enthusiasm for learning with my students. One year as a pre-kindergarten lead teacher, with a talent for developing a hands-on creative learning environment and curriculum. Consistent record of providing a safe learning environment for my students. Enjoy working with colleagues and parents to help students further meet their educational goals. Skills : Special Education, Spanish, PBIS, Coaching, Writing Consultant, Classroom Technology, Microsoft Office And Variety Of Technological, And Kahoots. Instructing diverse sixth-grade students in mathematics, English language arts, reading, science, and social studies. Utilizing multiple assessments in compliance with district and state requirements to inform instruction. Using innovative methods and materials to produce effective learning experiences including cooperative learning, thematic instruction, and differentiation. Serving as an instructional leader by modeling high expectations for students and implementing results-focused programs. Mentoring and coaching students to help boost their confidence and competencies, as evidenced by scores and completion of work. Participating in individualized education plan meetings monthly and effectively carried out IEP objectives in the classroom. Planning and implementing field trip experiences that enlightened the students. 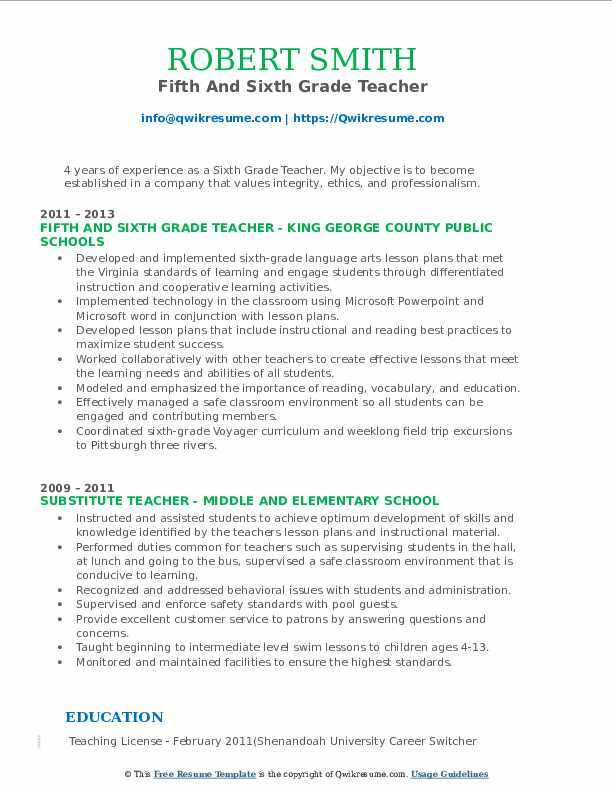 Objective : 2+ years of experience as a Sixth Grade Teacher is seeking to facilitate learning as a warm strict, culturally responsive educator; creating a supportive classroom community through high expectations in academics and behavior. Skills : Microsoft Office And Variety Of Technological Online Educational Games For Example Quizlet And Kahoots. Facilitating a smooth transition from the fifth-grade curriculum to a sixth-grade curriculum. Utilizing differentiated instruction methods with sixth-grade students in life science, reading, language arts and life skills. Initiating stem program in science to creatively problem solve including lego robotics. Incorporating games, peer tutoring, and manipulatives to stimulate math growth. Participating in bully prevention program at New Brighton middle school and guided bi-weekly discussions. Coordinating sixth-grade Voyager curriculum and weeklong field trip excursions to Pittsburgh three rivers. 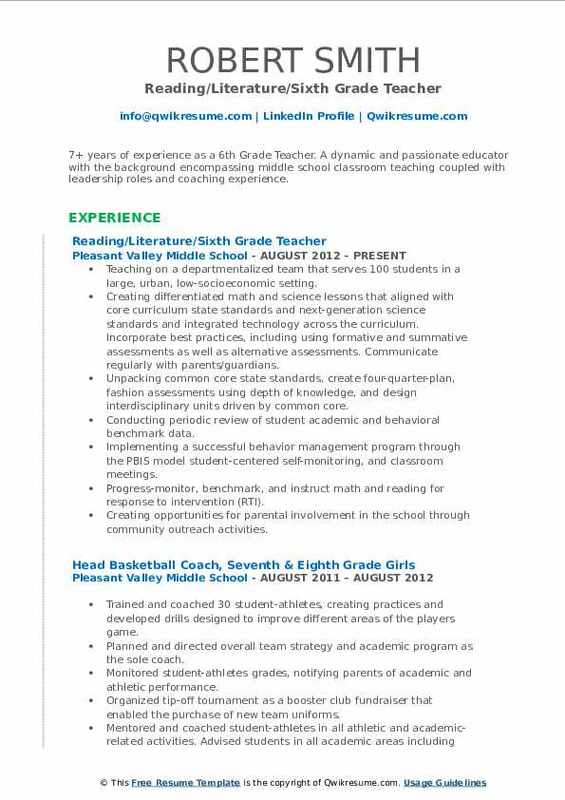 Headline : 5 years of experience as a Sixth Grade Teacher is seeking to secure an elementary/special education teaching position, instructional coaching position, or an educational leadership position utilizing my background in proficient teaching and leadership. 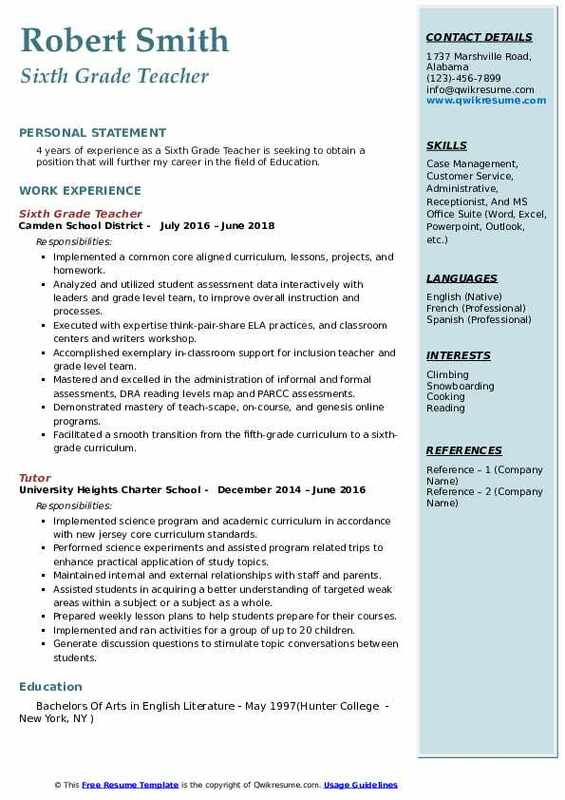 Skills : Certified Teacher, Experienced In Microsoft Office, Successfully Started And Run An Etsy Shop, Creative, Dynamic, And Flexible, Positive, Organized, And Self-motivated, Adapt Quickly To Change And Challenges, Problem Solver, Team Player, And Fast Learner. Taught extended school year (ESY) in autistic support setting for two years. Co-taught with special education and English as a second language teacher during math and literacy. Achieved success in differentiated instruction, specifically guided reading and guided math. Incorporated Promethean board, document camera, and other technology into lessons. Wrote sixth-grade literacy and math curriculum for universal companies. Set individual and whole class goals to boost the students' growth mindset and build student ownership of actions to foster academic success. Analyzed student testing scores and used students data to drive the creation of lessons for guided and targeted small groups in reading and math. Collaborated with English as a second language and special education departments to provide.